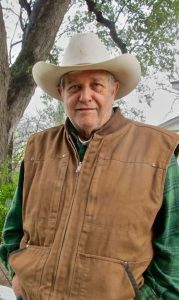 Larry Butler, farmer and a long-time leader in the local food community of Texas, died of liver cancer at the age of 70 on June 28, 2018, at Boggy Creek Farm, the East Austin vegetable farm that he and his wife and co-farmer, Carol Ann Sayle, began bringing into being in 1992. They eventually turned it, and its historic 1841 house, into the gem of an urban farm that flourishes today and is beloved, along with Larry and Carol Ann, in and beyond Austin. In addition to growing vegetables at Boggy Creek, Larry also cultivated vegetables on their farm in Gause, commuting between the two farms and bringing produce from Gause to Austin for market days. “Larry understood the necessity of nourishing the soil, so that he could succeed in the most noble cause, growing healthy, tasty food for anyone who made it a priority to eat well. For about the first ten years of farming, Larry and Carol Ann sold most of their produce at Austin’s Westlake Farmers’ Market and developed a large clientele, becoming public figures of a sort, both because of the quality of their vegetables and because of Larry’s gift of gab. Larry relished chewing the fat, and this made him stand out from more reticent farmers. So did his signature cowboy hats and crisp, clean khaki shirts and pants. “Tell ya what,” Larry would say, leaning toward you at the beginning of a conversation, and you never knew exactly what you were going to hear, though you could be sure that at least some of it would be funny and make you laugh. Around 2002, Larry and Carol Ann shifted from the farmers’ market to selling at their Boggy Creek farm stand at weekly market days. This shift added to their celebrity in local food circles and also put Boggy Creek Farm on the map as a destination not only for produce but also for special events such as farming workshops and fundraisers for the Farm and Ranch Freedom Alliance (FARFA) and the Texas Organic Farmers and Gardeners Association (TOFGA), which Larry and Carol Ann helped found. And so Boggy Creek became a magnet for growing numbers of aspiring farmers, some just to visit and ask questions of Larry and Carol Ann, while other aspirants came seeking employment as apprentices or regular staff. All of us at FARFA and in the local food community throughout Texas and beyond mourn Larry’s death, and yet we take heart that he lives on through the work of those he inspired and taught. To honor Larry and Carol Ann’s tradition of generosity in teaching aspiring farmers, FARFA announces the Larry Butler Memorial Scholarship Fund for Beginning Farmers. Its sole purpose is to provide financial assistance for novice farmers to attend FARFA, TOFGA, and other educational conferences. The fund will be managed by our sister (c)(3) educational organization, the Council for Healthy Food Systems, at councilforhealthyfoodsystems.wildapricot.org/Butler-Scholarship-Fund. Donations are tax-deductible to the extent allowed by law.